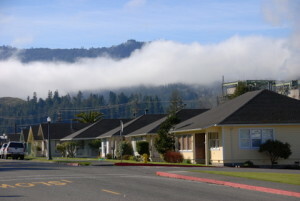 The quaint hamlet of Scotia, nestled among Northern California’s tall redwoods, was the country’s last company town. Since 1863 the entire community was owned by the Pacific Lumber Company. After a 2008 bankruptcy, the town fell into the hands of a Manhattan hedge fund and residents weren’t pleased, but that’s another story. I used to live in the neighboring county and I know the area well. It’s a beautiful place and for a long time Pacific Lumber had a good thing going with its mill and the fact that it owned the entire town. Company towns used to be fairly common. Not only could a company make good money through its industrial efforts, it could also boost its bottom line by renting homes, selling food and providing whatever services its captive audience required. Marketing to a ready-made group of consumers is as smart today as it was in the era of coal-mining and redwood-logging company towns. It’s just that the communities have moved from being constructed out of bricks and mortar to being built by bits and bytes. I’m talking about online communities. After you launch your business. Let me suggest that the best time to create this community is before you actually need it, which is before you launch your business, or launch an extension to your business. All too often today someone launches a startup and then scrambles trying to market it via the social media. What they are really trying to do is establish a coherent community. I like to think of this as a digital company town, with the advantage that “residing” in this digital company town is entirely voluntary. Once the community reaches some level of critical mass, it can be a target for sales and marketing. I recently listened to a Mixergy interview that illustrates this very nicely. Aaron Epstein developed a commercial web-based tool to work with colors called ColorSchemer. He eventually hooked up with Darius A. Monsef IV and Chris Williams who had founded a noncommercial site for color enthusiasts, called ColourLovers. Suddenly there were people on both sides of this equation that complemented on another – people who needed help with colors and folks who were great with colors. It eventually all came together in a self-contained digital “company town” that is now CreativeMarket. The point is that the online communities that have made CreativeMarket successful, were essentially in place before anyone got really serious about selling anything. Had Aaron, Darius and Chris tried to advance the CreativeMarket concept before they had established color-design communities, the project would have been 100 times more difficult to get off the ground. A bonus that comes by putting your community in place before you need revenue is that you can build your business around your interests. That’s what the principles in CreativeMarket were doing. Each was pursuing an area of interest and that makes the “work” less like work – if you see what I mean. Finally, your company town doesn’t have to be self-contained or a stand-alone entity. It can be a neighborhood within one of the major social media platforms. Find the best platform – Instagram, Facebook, Twitter, and the rest – to support your ultimate objectives, pick up a digital hammer and start building. Image: Scotia, California 146, by Barabas (Own work) [GFDL or CC BY 3.0], via Wikimedia Commons. This article originally appeared on RayManley.com and has been republished with permission.